← Nepal’s Annapurna Circuit: Is It Still Worth Doing? In Anishinaabe Pictograph Sites of the The Canadian Shield I provided an introduction to what has become a series of posts on native Indian rock painting sites in the Canadian Shield area. Originally one long and unwieldy post, it has since been divided into individual posts for each of the provinces or U.S. border states where the pictographs are found. This should make the search for specific sites that much easier. N.B. 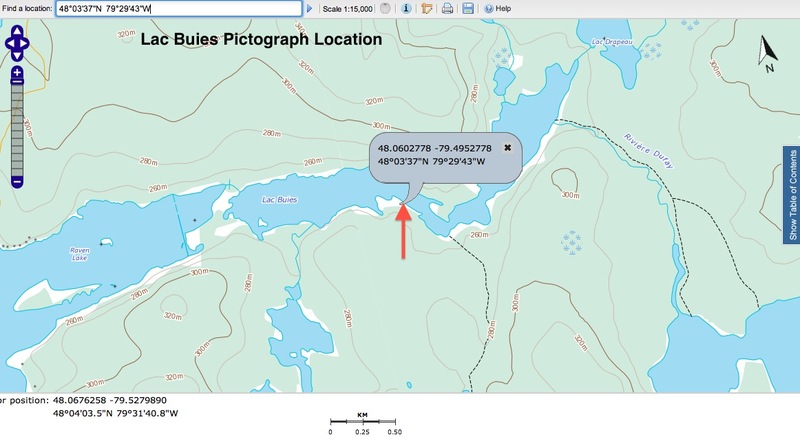 A click on blue text leads to a map, additional info and/or image. A click on an image will enlarge it. The Québec contemporary of Selwyn Dewdney was Gilles Tassé; together they released a study or two on rock art in Quebec in the 1970’s. The current leading Quebec researcher is Daniel Arsenault of the Université du Québec à Montreal. Here is a list of some of his various publications. Click on the following article title (Les Sites d’Art Rupestre au Québec) to see an online example of his work. (Scroll down to see the actual article.) Radio Canada in 2015 did a brief news story on Arsenault and his work titled Des sites d’art rupestre découverts en Abitibi-Témiscamingue. Update (Nov 2016): Last week I was shocked and saddened to hear of the accidental death of Prof. Arsenault, his wife, and his son in a car crash this past July. See here for the funeral home notice. A devastating loss to his family and to his colleagues and students – and to the wider community of those interested in L’Art Rupestre au Quebec and beyond. 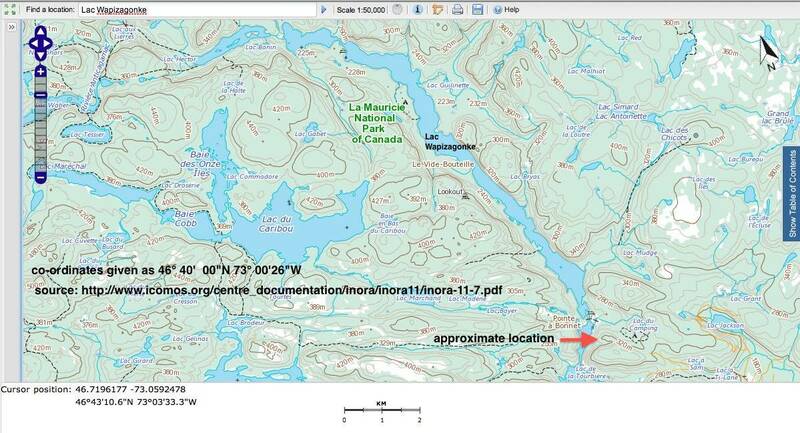 Lac Nemiskau – eastern James Bay area – a part of the Rupert River system; confirmed in the mid-1990’s; #2 site in Quebec in terms of importance/ the site is located in the NW section of the lake; see also here Dewdney’s notes on his failed attempt to locate this site. The most comprehensive discussion – Pascale Vaillancourt’s 2003 Université Laval doctoral thesis on the site – can be accessed here. The appendix (Annexe E) has a good set of pictures. Rocher a l’Oiseau / Oiseau Rock on the Ottawa River across from Chalk River. See also here and a link to info on the 54-min. documentary Great River (2010) by Matt Lemay here. Il y a quelque chose en français ici. Lac Cassette (Pepeshapissinikan) – The site is about 15 kilometers northwest of Forestville. 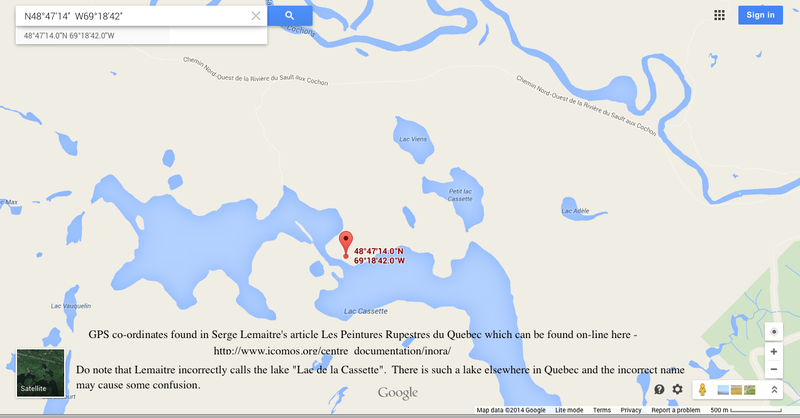 Confusion may be caused if you search for a “Lac de la Cassette”; there is one on the other side of the St. Lawrence. See this Google Map here for the two different lakes. See here for some pix and the story (n Finnish and English) of how Anne Nisula found the site in 1985 and then waited a decade for its significance to be confirmed. Another source of information is the chapter (pp. 344-359) by Daniel Arsenault in The Rock-Art of Eastern North America: Capturing Images and Insight (2004) edited by Carol Diaz-Granados and James R. Duncan. The chapter, entitled “Analyzing and Dating the Nisula Site”, can be read on-line (except for two pages) at Google Books – see here. This Youtube video also has images o the Nisula site. 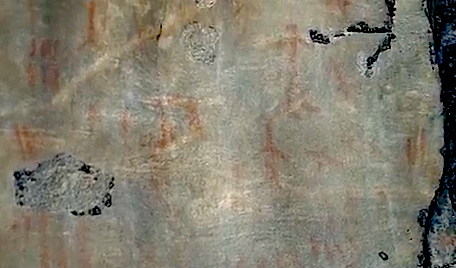 From the analysis, it would seem that the pictographs at this site date back about 2000 years and are much older than the rock paintings found at the other sites in Quebec and most of the the sites on the Canadian Shield. You can access an article by Serge Lemaitre here. 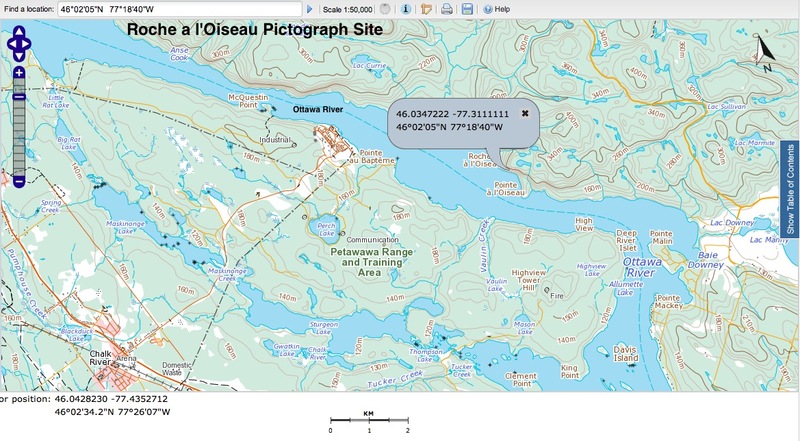 It is in both French and English and provides good summary information and gps co-ordinates on the following five sites – Lac Bluies; Rocher-a-l’Oiseau; Lac Simon; Lac Wapizagonke; and the Nisula site at Lac Casette. 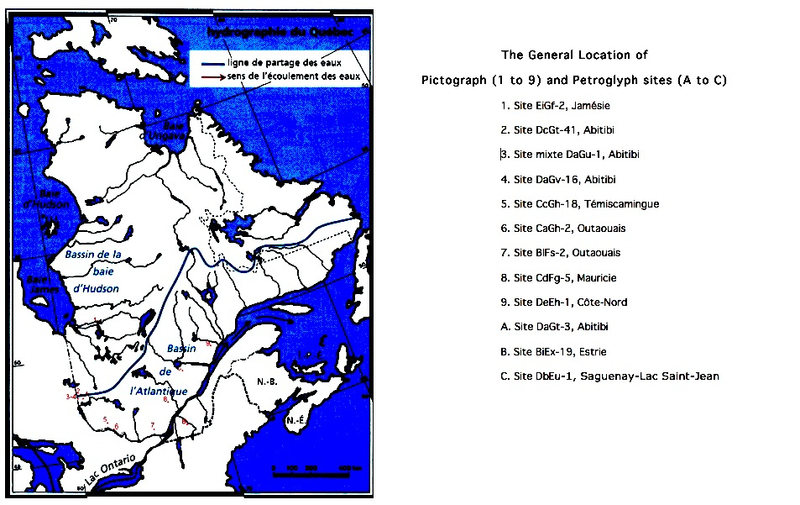 This entry was posted in Pictographs of the Canadian Shield and tagged rupestre autochtone quebec. Bookmark the permalink.